Some of our readers will remember the Pentax K-X DSLR, which is available in three colors in the US and Europe,white, black and red. 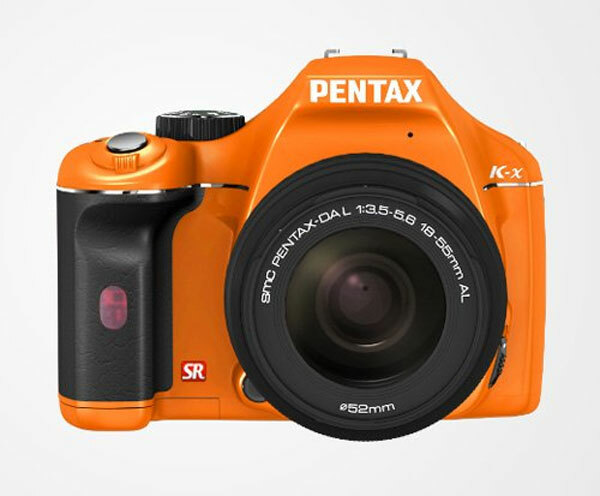 In Japan the Pentax K-X is available in some other funky colors, now these new colors are coming to the US. Pentax has announced that the K-X DSLR will also be available in orange, purple, blue and green as well as the standard red and black offerings. The Pentax K-x DSLR comes with a host of features, including a 12 megapixel CMOS sensor, capable of shooting up to 12,800 ISO in expanded range. The Pentax K-x DSLR comes with a host of features, including a 12 megapixel CMOS sensor, capable of shooting up to 12,800 ISO in expanded range. The Pentax K-X DSLR will be available sometime later this month in the US with this new color range, and prices start at $599 for the body only, and $650 with an 18-5mm lens, so if you have always wanted to get your hands on one of these brightly colored DSLR’s you wont have to wait long.